When you are just starting to learn the German language, the grammar might seem a bit overwhelming. 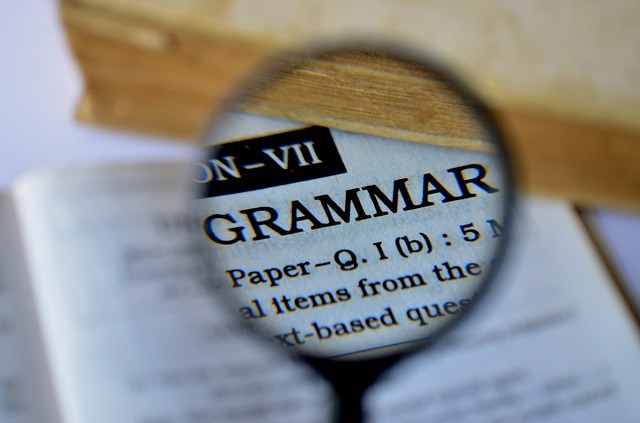 But fear not, we prepared a list of the most used German grammar terms to make the process of learning easier for you. You can save the pdf file to your computer or print it and refer to eat every time you see an unknown grammar term. das Substantiv/das Nomen – a noun is a person, a thing, a place. All nouns in German language are capitalized: das Deutschland(Germany), die Mutter(mother), das Buch(book). der unbestimmte Artikel – indefinite article refers to an unspecified noun: ein Buch(a book), eine Frau(a woman). das Genus – gender. German nouns can be masculine, feminine and neutral: der Mann(masculine), die Frau(feminine), das Mädchen(neutral), das Buch(neutral). das Pronomen – a pronoun is used to replace a noun: sie(she), er(he), es(it). das Verb – a verb describes what is being done: Ich bin zu Hause (I am at home). Du gehst zur Arbeit(You are going to work). der Infinitiv – infinitive is the basic form of the verb. This is the form that you find in dictionaries: gehen(to go), lernen(to learn), machen(to make). das Subjekt – subject is a noun or pronoun that does the action in the sentence: Die Frau liest das Buch(The woman is reading the book). Ich gehe nach Hause(I go home). direktes Objekt/Akkusativobjekt – direct object/object in the accusative case: Ich habe einen Bruder und eine Schwester(I have a brother and a sister). indirektes Objekt/Dativobjekt – indirect object/object in the dative case: Ich helfe meinem Bruder(I help my brother). Ich spreche mit meiner Schwester(I am talking to my sister). das Adverb – adverb describes the verb, another adverb or adjective: Ich fahre langsam(I drive slowly). Er spricht sehr schnell(He speaks very fast). die Präposition(en) – prepositions connect nouns to other words: Ich fliege nach Berlin(I am flying to Berlin). Ich warte auf dich(I am waiting for you). der Hauptsatz – main clause, independent clause: Ich gehe nach Hause, weil es spät ist(I am going home because it is late). der Nebensatz – subordinate clause, dependent clause: Ich gehe nach Hause, weil es spät ist(I am going home because it is late). die Konjunktion(en) – conjunctions combine words and sentences: ich und du(I and you), Ich gehe nach Hause, aber du bleibst hier(I am going home, but you are staying here). die koordinierende Konjunktion – coordinating conjunction combines two independent clauses: Gehst du nach Hause oder bleibst du hier(are you going home or staying here)? die subordinierende Konjunktion – subordinating conjunction links a dependent clause to a main clause: Ich kann nicht kommen, weil ich keine Zeit habe(I can’t come, because I don’t have time). der Nominativ – used for the subject of the sentence: Das Handy ist neu(The phone is new). Die Frau ist schön(The woman is beautiful). der Akkusativ – accusative is used for direct objects and after the prepositions that require accusative case: Ich habe einen Hund(I have a dog). Das Geschenk ist für dich(The present is for you). der Dativ – dative is used for indirect objects and with the prepositions and verbs that require dative case: Ich gebe dir das Buch(I give you the book). Ich bin in der Stadt(I am in the city). Ich spreche mit ihm(I am talking to him). der Genitiv – genitive is used to indicate possession. This is the least used German case: Das ist die Freundin meines Bruders(This is my brother’s girlfriend). Das ist das Haus meines Freundes(This is my friend’s house). There are also some prepositions that require Genitiv: Ich arbeite während der Woche(I am working during the week). das Präsens – present tense: Ich komme(I am coming/I come). Du siehst(You are seeing/You see). das Futur – future tense: Ich werde kommen(I will come). Du wirst sehen(You will see). das Futur II – future perfect: Ich werde mein Studium abgeschlossen haben(I will have finished my studies). das Imperfekt, das Präteritum – simple past (written past): Ich kam(I came). Du sah(You saw). das Perfekt – present perfect (conversational past): Ich bin gekommen(I came/I have come). Du hast das gesehen(You saw that/You have seen that). das Plusquamperfekt – past perfect: Ich hatte 8 Stunden gearbeitet(I had worked 8 hours). Er war nach Hause gekommen(He had come home). das Hilfsverb – helping verb is a verb that is used with another verb to create a different tense or mood: haben, sein, werden. Ich habe dich gesehen. Ich werde dich sehen. trennbare Verben – separable verbs – the particle is separated and put at the end of the clause: aufstehen – Ich stehe um 8 Uhr auf; einladen – Ich lade dich an. der Imperativ – the imperative is used to command or request to do something: Hör auf(Stop it!)! Hilf mir(Help me)! der Indikativ – indicative is used for stating facts: Ich gehe nach Hause(I am going home). Sie hat angerufen(She called me). der Konjunktiv I – subjunctive I expresses what someone else said: Er sagt, er sei um 8 Uhr gekommen(He says he came at 8 o’clock). der Konjunktiv II – subjunctive II is used for hypothetical statements: Ich würde sagen(I would say). Er würde helfen(He would help). Du hättest gesagt(You would have said). 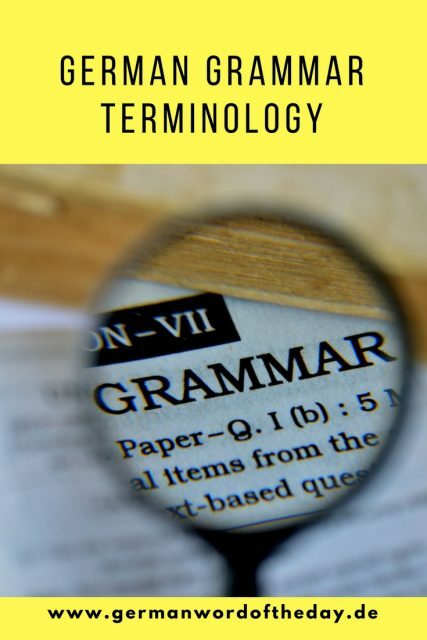 Do you know any other grammar terms that were not included in the post? Let us know in the comment!